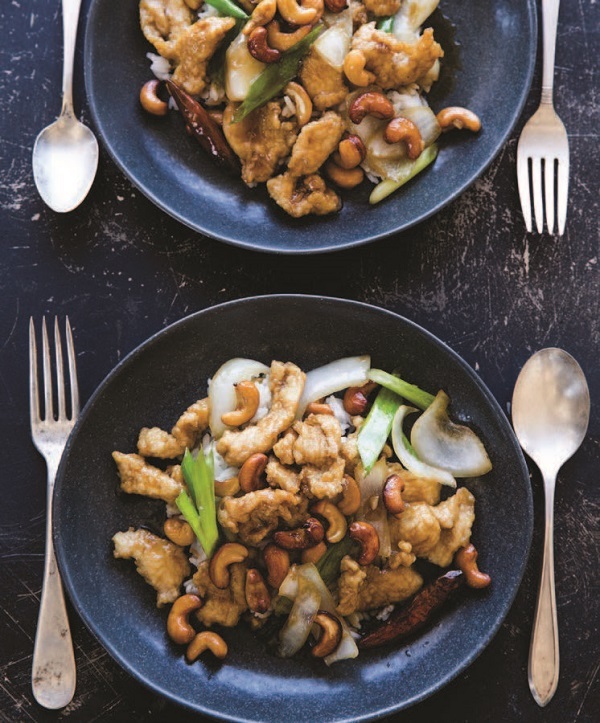 A Bangkok native (and current Chicago resident), Leela Punyaratabandhu, knows first‐hand that even Thai cooks take shortcuts. With Simple Thai Food , Leela presents recipes from her beloved home country, all tested and tweaked to ensure that even the busiest American cook can prepare them at home. 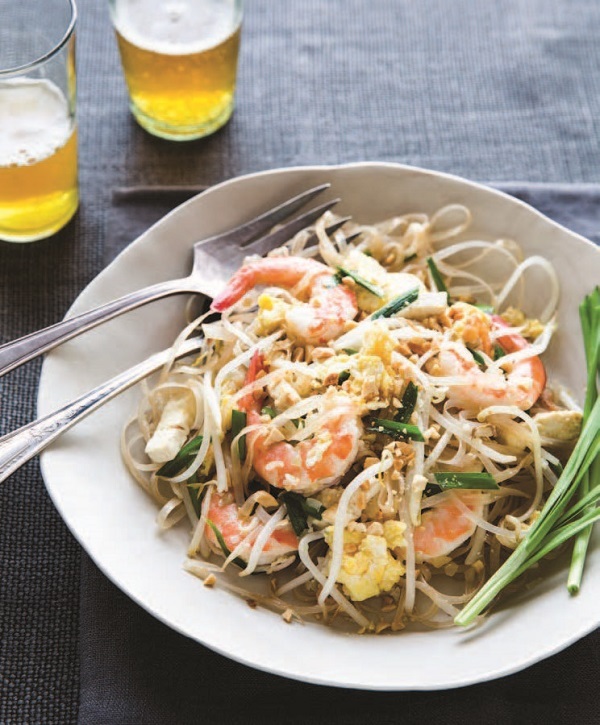 Recipes range from pleasantly familiar classics like Pork Satay with Peanut Sauce, Pad Thai with Shrimp, and Tom Yum Soup, to the exotic—including soon‐to‐be‐favorites like Son‐in‐Law Eggs and Fried Fish with Green Mango Salad. 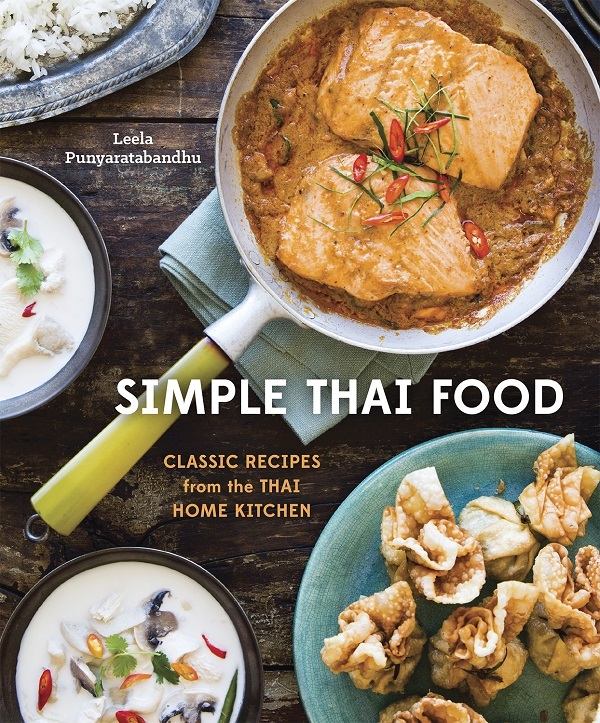 Including chapters on key ingredients and tools, base recipes, one‐plate meals, classic rice accompaniments, and even Thai sweets, Simple Thai Food is a complete primer for any home cook who wants to give Thai cooking a try. Reprinted with permission from Simple Thai Food by Leela Punyaratabandhu, copyright ©2014. Published by Ten Speed Press, a division of Penguin Random House, Inc. Photography (c) 2014 by Erin Kunkel. Support your local bookstore, or buy the book through our affiliate links at IndieBound or Amazon.com. Miang , which I like to call “leaf-wrapped salad bites,” is a bit of an interactive dish: Various items—in this case, finely diced ginger, shallot, and lime; dried shrimp; flaked coconut; chopped peanuts—are assembled on a platter. Diners are invited to grab a palm-size leaf, pile on it a little bit of each component, top the whole thing with a drizzle of sauce, wrap it up into a small bundle, and then consume it in one perfect bite. 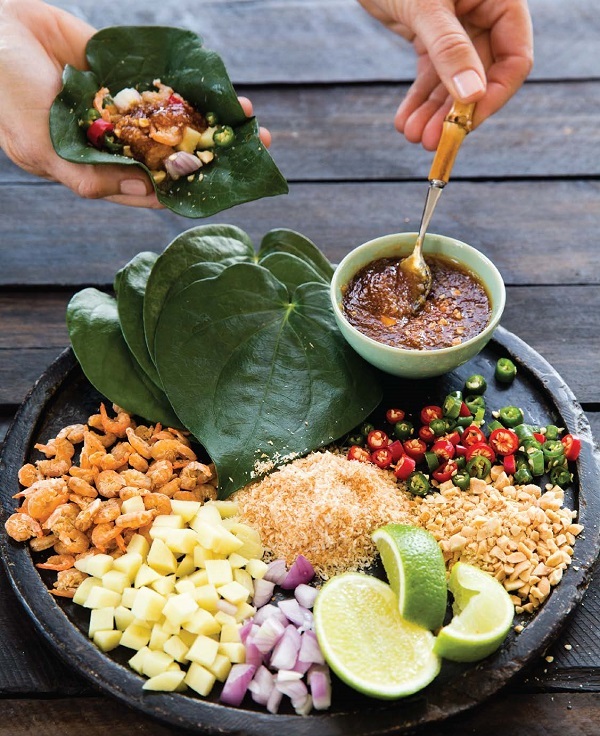 Miang kham , one of the best-known of these flavorful salad bites outside of Thailand, is dressed with a thick, sweet sauce and traditionally wrapped in cha-phlu leaves, which are known as la lot in Vietnamese and wild betel leaves in English (not to be confused with betel leaves). In their absence, you can use young deveined collard greens or tender leaves of Chinese broccoli; in the case of the latter, the dish is often called miang khan . To make the sauce, soak the dried shrimp in hot water for 15 minutes. Meanwhile, trim off and discard the leafy parts of the lemongrass stalk, remove the tough outer leaves of the bulb portion until the smooth, pale green core is exposed, and trim off the root end. Working from the root end, cut the bulb crosswise into paper-thin slices, stopping once you reach the point at which the purple rings disappear. Set the slices aside and discard the remainder. Put the dried coconut flakes in a wok or 14-inch skillet and toast them on medium heat, stirring constantly, until medium brown, about 2 to 3 minutes. Reserve 2 tablespoons of the toasted coconut flakes for the sauce and set the remainder aside for the salad. Wipe out any toasted coconut sediment from the wok. Add the lemongrass slices, shallot, galangal, and ginger to the clean wok, then toast over medium-high heat, stirring constantly, until fragrant and the shallot slices are dry to the touch, about 5 minutes. Place the toasted mixture, drained dried shrimp, and shrimp paste in a mortar or a mini chopper and grind to a smooth paste. Put the prepared paste, sugars, fish sauce, and water in a 1-quart saucepan and bring to a boil over medium-high heat, stirring constantly. When the sauce has thickened and reduced to about 1 cup, after 2 to 3 minutes, take the saucepan off the heat. Let the sauce cool completely. Once the dressing is cooled, stir in the chopped peanuts and the reserved 2 tablespoons toasted coconut flakes and transfer to a small serving bowl. To prepare the salad, quarter the lime lengthwise and trim away the core. Cut the quarters into ¼-inch dice, leaving the rind intact. Alternatively, for those who are sensitive to the bitterness of the lime rind, cut the lime into wedges (as shown in the photograph) and invite diners to squeeze about ½ teaspoon lime juice onto each composed salad bite. Arrange the lime, ginger, shallots, peanuts, chiles, dried shrimp, cha-phlu leaves, and the dressing on a large serving platter. To eat, put a leaf on your palm, add a bit of each component to the center of the leaf, top with a small spoonful of dressing, gather up the corners of the leaf to form a bag, and eat the whole thing in one bite. Note: If the diced ginger tastes too spicy hot, rinse it in cold water three or four times until the water runs clear and blot it dry. Cut the chicken against the grain and on the diagonal (30- to 40-degree angle) into thin, bite-size pieces. Place the chicken in a bowl, sprinkle the cornstarch over it, and stir well, making sure each piece of chicken is coated with the cornstarch; set aside. Cut the yellow onion through the stem end into 1⁄2-inch-thick slices. Cut the green onions crosswise into 2-inch lengths. Add the white parts to the yellow onion slices. Keep the green parts separate. In a small bowl, stir together the oyster sauce, soy sauce, sugar, and water, mixing well. Set aside. Line 2 plates with paper towels and place them near the stove. Heat the oil in a large wok or a 14-inch skillet over medium heat. When the oil is hot, add the cashews and fry, stirring constantly, until golden brown, about 1 minute. Using a slotted spoon, immediately transfer the nuts to a towel-lined plate. Do your best to keep as much oil in the pan as possible, as we need to fry two more ingredients in it. With the pan still over medium heat, add the chiles and fry, stirring constantly, until crisp, about 1 minute, taking care not to burn them. Using the slotted spoon, transfer the chiles to the cashew plate and set the plate aside. Turn up the heat to high. When the oil is very hot, add half of the chicken, gently lowering each piece into the oil and leaving room between the pieces. After 1 to 2 minutes, one side of the chicken should feel firm when you touch it with the end of the spatula. This is your cue to flip the chicken pieces. Do not go by color, because the oil has taken on the color of the dried chiles and the chicken will look golden brown when it is still uncooked. Also, do not stir the chicken around, as you want each piece to develop a soft crust. Once that has been achieved, using the slotted spoon, transfer the chicken to the second towel-lined plate. Repeat with the remaining half of the chicken. Discard nearly all of the oil in the pan, leaving only a thin film to coat the pan bottom, and return the pan to high heat. Immediately add the garlic, the yellow onion, and the white parts of the green onions and stir them around. When the onions have softened a bit, after about 1 minute, add the chicken to the pan along with the oyster sauce mixture (be sure to use a small rubber spatula to get every bit of the sauce out of the bowl) and stir everything around constantly. The sauce should evaporate quickly, without turning the coating of the chicken soft and gummy. Immediately add the green parts of the green onions and the fried cashews and chiles and stir-fry for about 30 seconds. At this point, everything should be heated through and the green onion tops should be wilted. Remove from the heat, transfer to a platter, and serve. Note: It is imperative that you use either a large wok or a 14-inch skillet, unless you halve the recipe. At the frying stage, using a cooking vessel that is too small may not present a problem. But at the stir-frying stage when we want the liquid ingredients to form a glistening sauce quickly, fast evaporation is crucial. If at any point the chicken looks like it is taking its sweet time stewing gently in a bubbling sauce, either the pan is too small or the heat is too low. Follow the instructions as closely as you can, and at any time that there appears to be a difference between your stove’s output and my stove’s output, use your instinct. Immerse the noodles in room-temperature water to cover for 30 to 40 minutes, until soft enough to wind around your fingers without breaking. Drain and cut into 6-inch lengths with kitchen shears. Set aside. In a small bowl, stir together the sugar, tamarind, and fish sauce until the sugar dissolves. Set aside. Heat 3 tablespoons of the oil in a wok or a 14-inch skillet over medium-high heat. When the oil is hot, add the drained noodles and stir until the noodles are coated with the oil and have become more pliable but not yet cooked through, about 1 minute. Add the prepared sauce and stir-fry for 1 minute to coat the noodles with the sauce. Push the noodles to one side of the pan, add the remaining 2 tablespoons of oil to the empty side of the pan, and add the shallot, garlic, radish, tofu, and dried shrimp and stir-fry for 1 minute on their side of the pan while the noodles are cooking in the sauce on the other side. Add the fresh shrimp to the shallot side of the pan and stir-fry until the shrimp are half cooked, about 1 minute. Stir the noodles around once while still keeping them on their side of the pan. Make a well in the center of the pan, add the eggs to the well, and scramble and shred them with the tip of the spatula until the egg bits are cooked through, about 1 minute. By this time all the moisture should have evaporated, the noodles should have become softened, and the shrimp should have been completely cooked. Do a strand check to see if the noodles are soft enough. If all of the moisture has evaporated and the noodles are still undercooked, add a little water as needed. Once everything is ready, remove the pan from the heat. Fold in the chives and half of the bean sprouts and let the residual heat wilt them. Plate the noodles and serve with the remaining bean sprouts and the table condiments and seasonings for adding as desired. We encourage you to support your local independent bookstore but for your convenience you may also use our affiliate links for Indiebound and Amazon.com to purchase Simple Thai Food. Leela Punyaratabandhu grew up in a traditional Thai home in the heart of Bangkok where cooking was taken very seriously. Leela created the cooking blog She Simmers, which in 2012 was voted “Best Regional Cuisine” blog by Saveur. Her writing has appeared on CNNGo, a website on Asian travel destinations by CNN International, and the award‐winning food website Serious Eats, among others. She divides her time between Chicago and Bangkok. This entry was posted in Eat and tagged Eat, recipe, Thai. Bookmark the permalink.